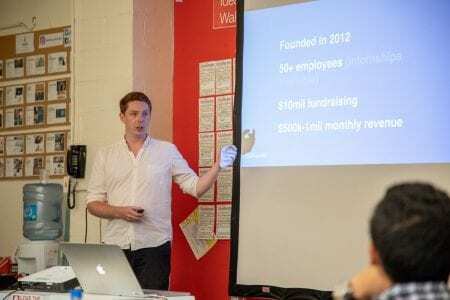 The Accelerate space has been bumping since the calendar flipped the page to September, with a Pre-WOW Week event, the first fall HotSeat (which debuted at Workbar Back Bay), and a KickStart all in the books as the weather starts to, mercifully, cool off. 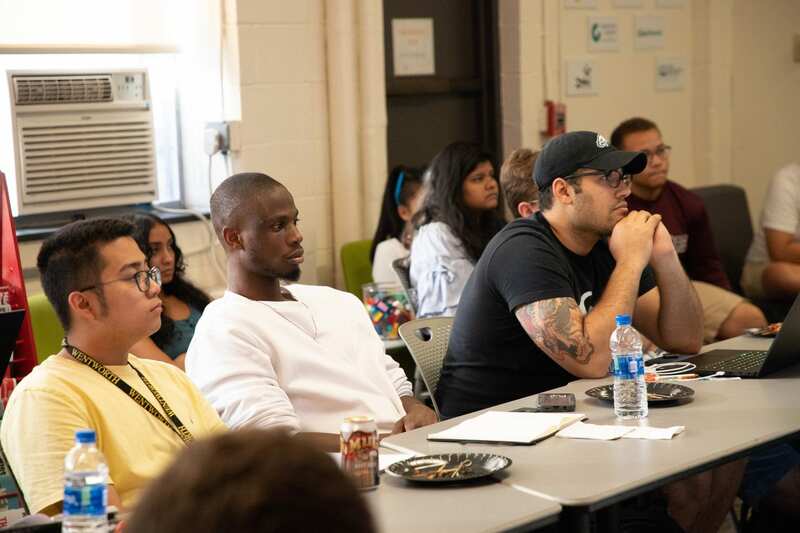 This past week was no different, and on Monday September 17th, approximately 40 students piled into Wentworth’s Center for Innovation + Entrepreneurship for our BootCamp! Kicking off the night was Duncan Walker, the VP of Research & Development at Jebbit, on hand to help the assembled students learn how to identify achievable, but ambitious, goals and milestones for themselves as they begin their entrepreneurial journey. Duncan suggested that two of the most important qualities one could have as an entrepreneur are perseverance (which he defined as a combination of resilience, initiative and positivity) and focus, with the caveat that one must also be willing to adjust their focus areas as their ideas evolve over time. He also emphasized the importance of “Loving the Problem,” a mantra that has become a mainstay here at Accelerate. Starting a business starts with having an idea, but from there you must define what problem you’re solving, and discern the best method of solving that problem. Duncan was followed by a crowd-favorite, WIT Assistant Professor of Mechanical Engineering, Stephen Chomyszak. Professor Chomyszak took the stage with a presentation centered on design. He expounded on the usefulness of visualization within our imagination, and the dangers of being overly reliant upon computer models, reaching the ultimate conclusion that physically tangible creations are the best practice for achieving good design. He identified three build-types to progress through before starting production: a mock-up, a proof-of-concept, and a prototype. Creating physical models allows us to not only clearly see the flaws of our design, but also test out our creations and see how they work, and how they don’t. 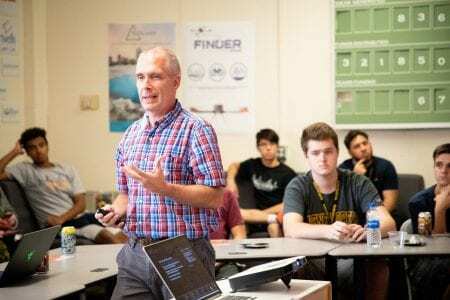 After Professor Chomyszak wrapped up, the students were introduced to the Accelerate entrepreneur-in-residence this fall, David Lewis. David broke down to the audience the importance of differentiating between a potential business, and a hobby. He presented a similar development framework to the one presented by Duncan, with an emphasis on starting with the problem, rather than the solution. David’s framework followed five steps, and featured one key differentiation, starting with the problem and then developing your idea once the problem has been identified. From there, he directed students to form a solution, market their solution, and eventually launch it. David also talked about two more important factors of success, collaboration and timing. The first is easy to achieve, and by working as a team, we run into fewer roadblocks because we’ll have people on our side with different perspectives who can solve problems we ourselves cannot. The second, timing, is much harder and unfortunately requires a good bit of luck. Their work was born after observing a problem. Rural communities like Orange had less access to the advanced technological resources available in cities, and thus community members were being deprived of that opportunity to create. LaunchSpace offers a maker lab to local residents, and hopes to spread their ideas on a national level and bring design thinking concepts and resources to other areas that lack them. A healthy number of students stayed for the duration of the three hour evening, and the Accelerate team was greatly appreciative of those that did, as well as all of the students who were able to attend some portion of the event.